The bathroom color that you choose is going to create a mood. This is an easy and a simple update. However, just painting a bathroom might seem like an easy fix at first just because it is a small space. However, finding the right color can be a little bit difficult. At the same time you do have to paint around a lot of tile and fixtures. This means that a small paint job can take a lot longer than you might have expected so you want to make sure that you get the interior color right the first time. Consider going with a metallic tone. This doesn’t mean that you have to have a ton of sheen to it. Instead, you can just draw in soft yellows that are going to coordinate beautifully with any gold or brass fixtures that you have in your space. At the same time you could use a very light gray or blue to compliment any silver lighting that you have in your space. Usually lighting is one of the things that get dated the most often. However, just installing a simple vanity light really isn’t going to cost that much and it is going to make a huge impact in the space. 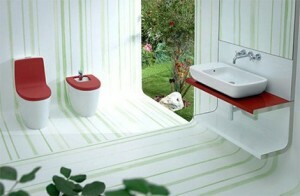 Try to lighten things up with your bathroom color. This is as simple as painting a wood vanity with a light cream color. This really gives you the opportunity to save a lot of money by using paint on a multitude of surfaces. Even if you just go with a pastel paint color then this is really going to contrast against a white accent. Going with lighter colors is pretty traditional in this kind of design just because it is such a small space. However, you can still use actual color as long as you just find that perfect shade to compliment what you already have in your space.